I’ll bet somewhere in your stamping stash, you’ve got a heart stamp. These popular designs are happily found in stores (both online and off), especially this time of year. And if you don’t have one, they are also easy to create using an eraser and linoleum cutters (or even craft foam for that matter!) 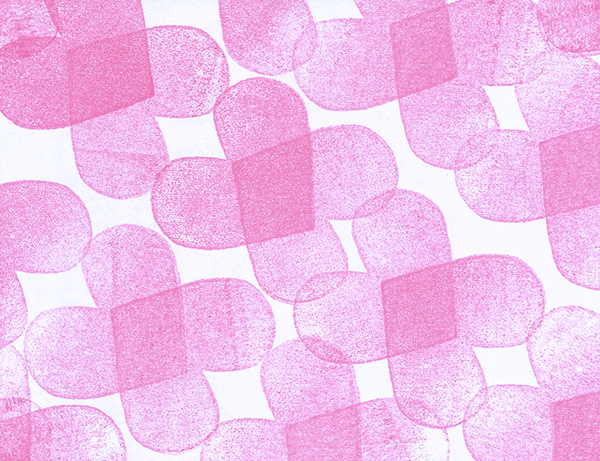 Want some ways to use them beyond simply stamping them once as a central image on a card? In my January 31st post, I looked at seven ways to use a cedar branch rubber stamp design. Let’s do something similar using a heart. This particular heart is a solid design from Rubber Tree Stamps, but solid heart stamps from lots of different stamp companies can be used very similarly. 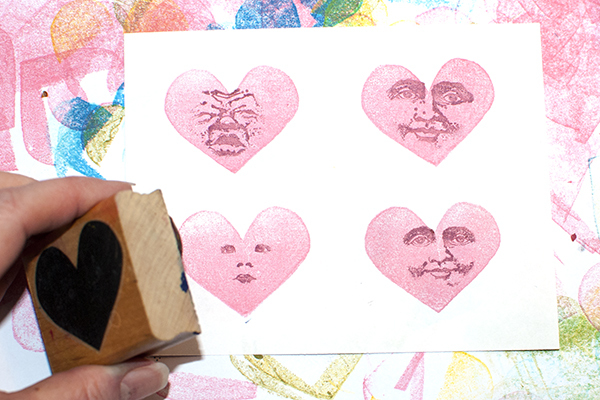 And if you have a heart stamp that is patterned rather than solid, give it a try too! Note: Like the cedar branch stamp post, I picked a stamp to play with and stamped it roughly on pieces of copy paper. None of these examples are neat finished cards. They are the results of experimental play. Let yourself just try things without getting too hung up on perfection in this stage. Once you find uses for your stamp that you really like, you can then pull out your good stamping cardstock and stamp more carefully. With a very small heart stamp, you might stamp the heart repeatedly along the edge of a card to create a pretty border of hearts. But the stamp I’m using is about 1 1/2″ tall and 1 3/4″ wide when stamped. I could use that to create a border but it would leave very little room for the center design area unless the card was fairly big. But you don’t have to use the whole heart stamp to create a border! You might, for example, just use the top curved parts of the stamp to create a card frame. You could stamp them very evenly and carefully or stamp them a bit willy-nilly for a more carefree look. Or just use the tips of the heart along the edge of the card. You could keep the tips the same size or vary the size. You could stamp each tip right next to each other or space them out or allow them to overlap each other. Or use a little more of the stamp so you see the tip and a bit of the curve. This version is uneven and quirky. Just as an example, here is another heart stamp, this one a patterned heart by Alias Smith & Rowe. Different stamp, similar use, different effect. In each of these examples, the border or frame created doesn’t shout, “heart!”. 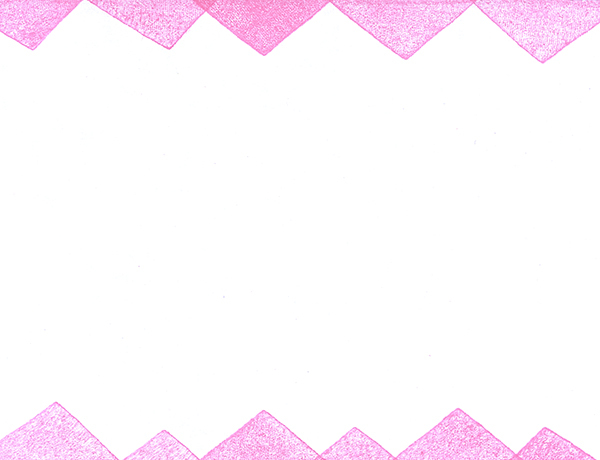 Here I’ve stamped them in a heart friendly pink, but you could stamp any of these borders in any color you like because they aren’t meant to represent hearts. 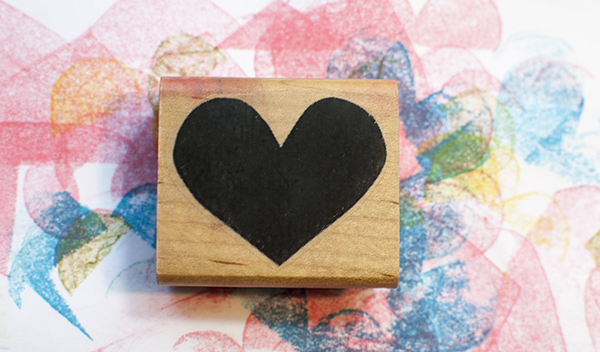 Another way to use a shape image like this heart is to stamp them repeatedly across a piece of paper to create a background. 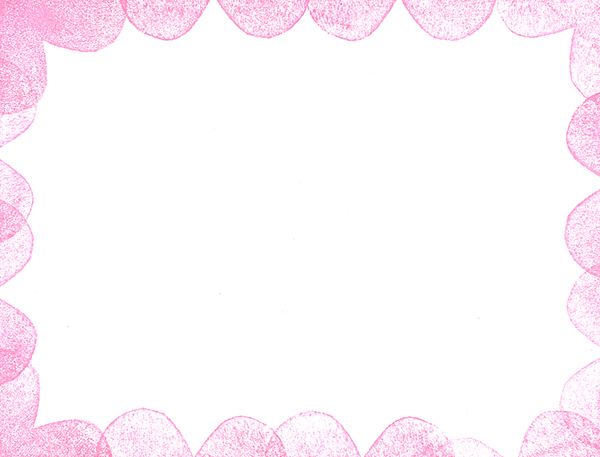 You could of course stamp them separately in even rows and columns or even randomly across a background, but I wanted to play with overlapping the stamped hearts to see what would happen. I was using Ranger’s Antiquities inkpad in Chinese Red. 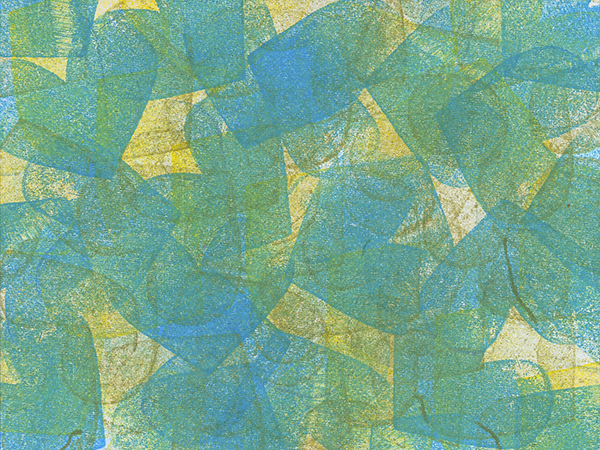 It is a pigment ink on a felt pad that stamped in a fairly translucent way, but with a texture from the inkpad, giving me interesting pattern and image overlaps. 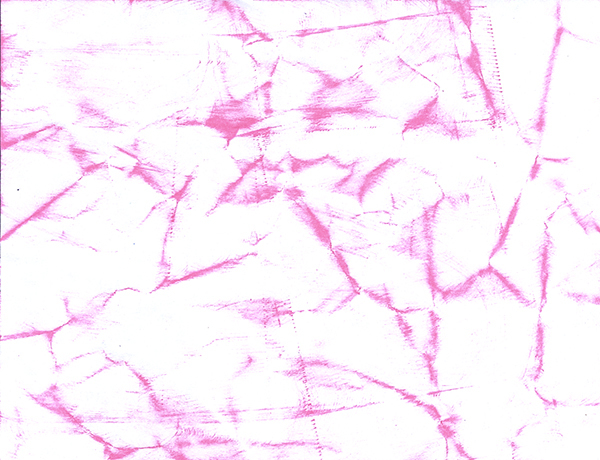 This effect will vary by the ink and the pad you are using. 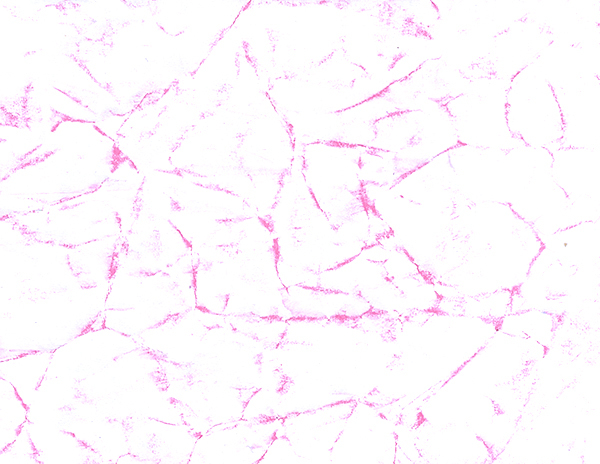 Here I tried stamping the hearts repeatedly, alternating their orientation in the first four columns. 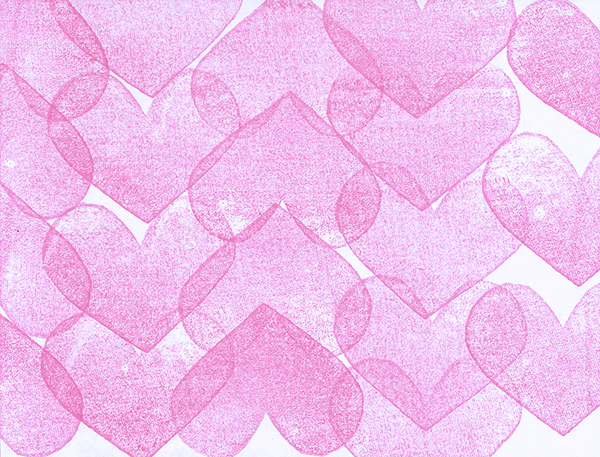 Then I tried stamping the hearts more tightly and diagonally, densely filling the entire card. 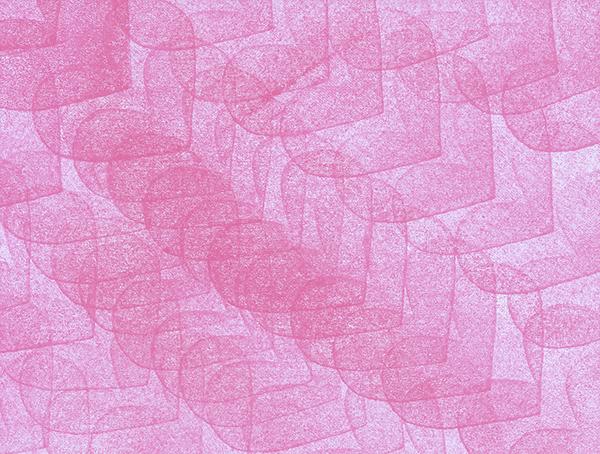 I also tried stamping the hearts and then flipping them around and overlapping them to create a kind of quirky background that is less obviously hearts. Finally, I tried stamping them in three different colors (yellow, green, blue) in a haphazard overlapping way. 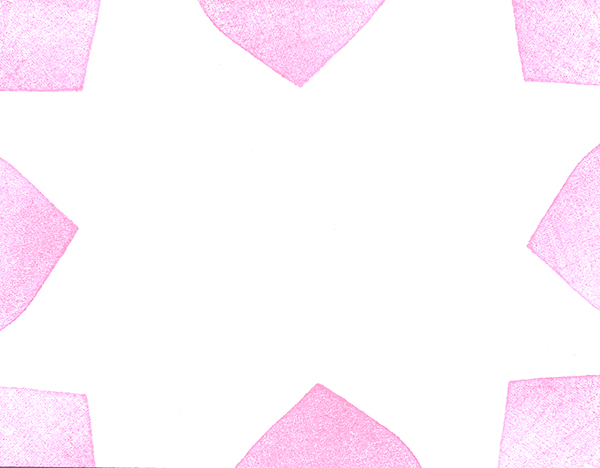 If you are paying attention to this background, you can tell they are hearts but the pattern of colors has become more important than the pattern of the stamp shape. This is a pretty outside the box use for a heart stamp. This time around, no one is going to know that it was done with a heart stamp. And honestly, you could do this with other solid stamp shapes. This general size does work well however. Smooth out the paper on your work surface. 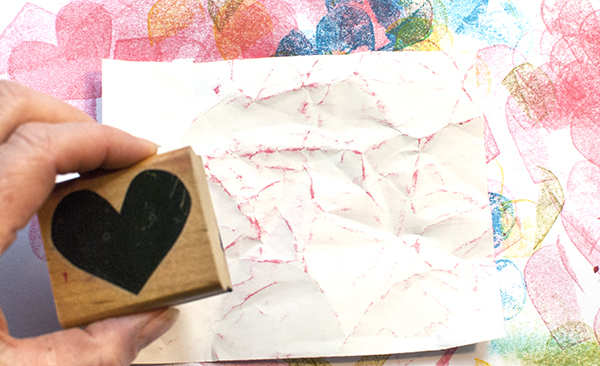 Ink up the solid heart stamp and rub it across the paper. 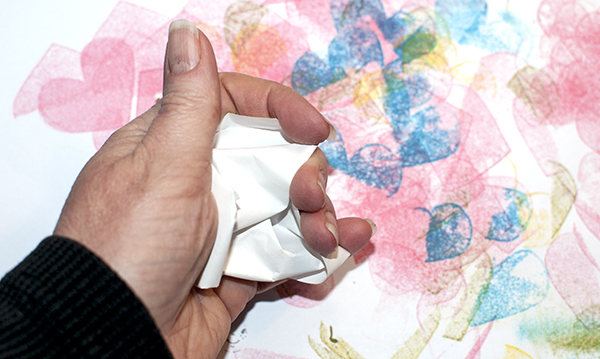 It will tend to hit the high creases, giving you a rough distress background look. You might wonder why you would want to use a stamp for this when you could just rub an inkpad across the paper. You definitely could, so try it both ways. I think you may find, depending on the ink and paper you are using and the pressure you exert when you rub, that the look you get is a little bit different. I felt that I had more control using the stamp. Because the ink gradually rubs off the stamp, the crease inking is softer and more subtle. Because the inkpad itself has lots of ink, it can result in darker ink on the creases as shown below (which may of course be what you want.) Neither method is the “right” method. Try both and see what you think. 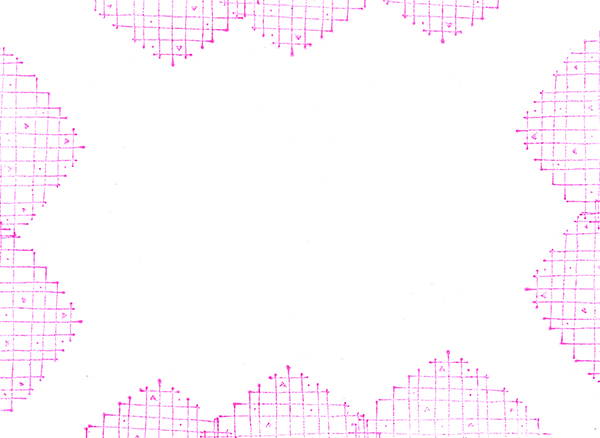 One fun way to use solid stamps, particular ones that have rounded edges like this, is to turn them into balloons. It doesn’t take great drawing skill to draw in strings underneath and that is all it takes to make them balloons. Simple but fun! 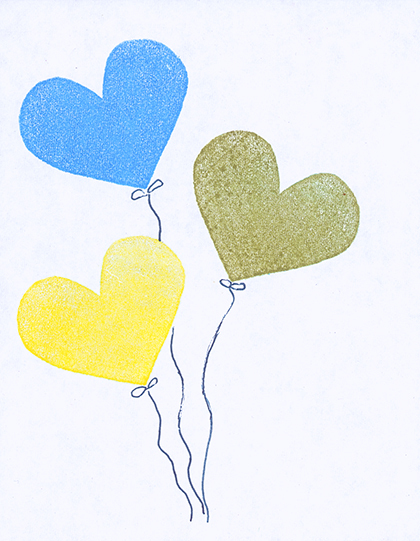 If you really want to go quirky, add faces to your stamped hearts. 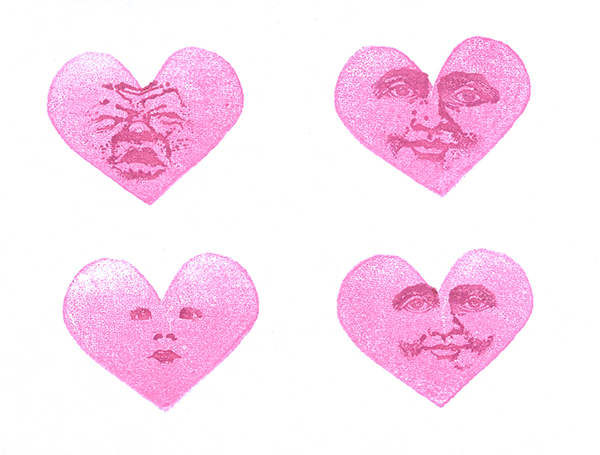 You can use a pen and draw in your own, or use faces from other rubber stamps that will fit your heart. Here is how I combined them. This could make a fun card. What do you think these four hearts are saying to each other? To combine the images face and heart images: I used a regular dye ink water-based marker to ink just the face areas of the various stamps and then I stamped them on the card. Next I inked up the heart and stamped it on top of each face. It can be tricky to line these up. If I was doing it for an actual card, I think I’d use a stamp positioner to be sure that I got each face just where I want it. 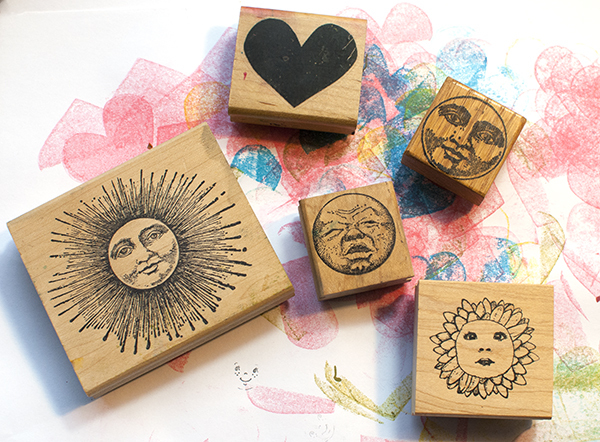 Play around with your heart (and other shaped) stamps and see what you can come up with. Smaller hearts or larger hearts may provide more uses. If you have hearts in several sizes and/or designs, you might find that you can use them in alternating patterns or overlap them in interesting ways. Try different colors and different inks too. Some hearts can be stamped medallion style in green to create a four-leaf clover for St. Patrick’s Day. Play around. I’ll be you’ll come up with lots of ideas! What a fun play day you had!!! Great results and unusual as well. Great thinking outside of the box. Really enjoyed this. Great use of this heart stamp. Great idea using the faces inside. Thanks for the inspiration. My first visit! Nancy I seen your comment on the frugal crafters website and headed over here. so glad I found the site. Now new subscriber! Nancie, I am so glad I found you again! I used to be a subscriber way back in the early 90’s all the way to ’98 until I had to move to Asia. I even bought all your back issues and I still have my entire collection :) do you still publish VSN or is it all online now? I missed it SOOO much! So happy to be able to read your articles again. Obviously I’m a subscriber again :) stay well.